Fat Bruce Lee and I had a lunch meeting, and that meant that we had the opportunity to try a new burger with a client. On this day we chose 3 Square Café. This was the post-Röckenwagner establishment that Hans Röckenwagner opened to serve simple food. What I took away was that 3 Square Café was serving over-priced, low-quality food to an established fan base. 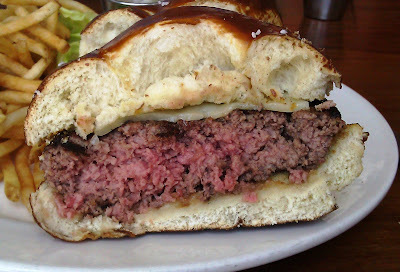 Not to skip too far ahead, but this was the first burger that managed to get Fat Bruce Lee angry. We ordered three of the $12.50 beef Pretzel Burgers. The burgers took a little over 20 minutes to arrive. It was not worth the wait. Ready...Set...Terrible! The Beef: The beef came to 3 Square Café pre-ground, and it was ground far too finely. The 100% Angus beef blend was 20% fat, 10% Sirloin, and the remainder was Chuck. The burger was an 8 ounce patty. The beef was dismally bland and oily. It tasted of nothing--no beef--no aging--no blood--no minerals. The texture was nearly invisible due to the dry bun and the fine grind. The only flavor that managed to come through from the beef was bitter carbon from the grill marks. I ordered my cheeseburger with no caramelized onions, but the kitchen put them on the burger anyway. I heard our server instruct the kitchen to fix that oversight. Rather than providing a non-onion flavored patty, they simply removed the onions from the patty and then flipped it over, so that I wouldn't see this. I noticed, the beef tasted of onions--sloppy. If you take a close look at the photo, which shows the sear on the patty, you will notice a bit of the onion still stuck to the beef and onion juice on the bottom bun. To make matters worse, the beef was far too dry to counter the bready, dry bun. The fine grind allowed far too many of the juices to escape the beef. The Seasoning: The beef blend was bland and unseasoned. The exterior of the patty was also bland--there was no seasoning on the burger with the exception of the unwanted onion residue. The Sear: The grill was hot enough to char rather than sear the beef. The Preparation: The finely pre-ground beef was pressed into round burger molds. 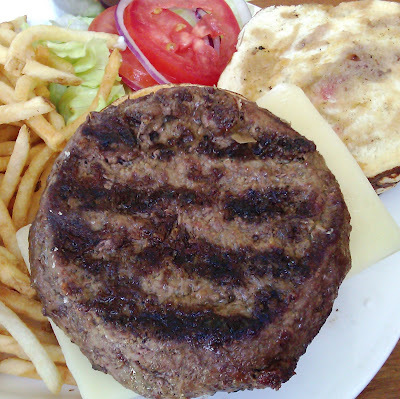 This was evidenced by the straight, flat sides of the uniformly round patties. The patties were 8 ounces each. 3 Square Café cooked the burgers on a too hot, wide-grated, gas-fired grill. The preparation was completely soulless and without regard for flavor. The kitchen served bland, unseasoned burgers. The kitchen did cook the beef to the Medium, which I requested. The Cheese: Swiss Cheese was what this burger came with. The cheese contributed nothing. The cheese was mild, dry, and uninteresting. The Bun: The hook was the house-made pretzel bun. I am a German, ex-fat kid, and I know my way around a pretzel. A good, fresh pretzel is a thing of beauty. Yeasty, chewy, moist, and salty are what I look for in a pretzel. In the case of the pretzel bun at 3 Square Café, what I had to work with was dry and salty. The salt was a welcome addition to the nearly flavorless beef. The bun looked like a pretzel with the rock salt and the dark finish, and that was where the flattering similarities stopped. The dry bun in concert with the dry cheese and the dryish beef made the dish impossible for myself or our guest to finish. Fat Bruce Lee heroically unhinged his jaw and took down this dry monster like a snake swallowing an egg. The Meat To Bun Ratio: It was impossible to tell. Neither was sufficiently palatable to distinguish the correct ratio. The Fries: The thin, shoestring fries were fantastic! The cut in-house, peel-on, skinny fries were perfectly cooked and seasoned. They were wonderfully crisp. The Toppings: The Roma tomato slices were on the mealy side, and the choice of green was a slab of iceberg lettuce. The toppings were decidedly non-premium in spite of the premium price tag. Oh, the "Diet Coke" was actually Diet RC or some such off brand--unpleasant. One of the minions upon whom I inflicted the half portion that I took back to the office described this cheeseburger as "grade school cafeteria quality". He spiked it in the trash after two bites. Fat Bruce Lee was simply incensed, "That was a joke. I can't believe they put that on a plate an served it." Our guest quipped, "What's dryer than a pretzel stick? 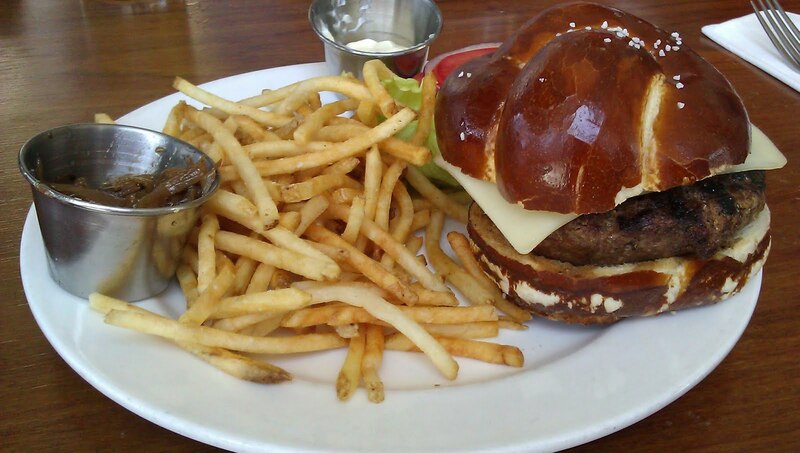 A Pretzel burger." Burger Review : Nein, danke! 3 Square Café served up an over-priced, bland, dry burger. It was like eating a German train schedule...it was precise, dry, and joyless.